“Budget Promises – Beyond Parliament” (www.budgetpromises.org) is a pioneering online platform developed by Verité Research. This platform takes stock of the government’s track record in executing the 2017 budget promises during the first six months of the year. It asks two basic questions about the government budget: Are they saying what they are doing? And are they doing what they are saying? The answers to these two questions are tracked using two indicators. First is the openness indicator. It measures the willingness of government agencies to provide information about what they are doing in terms of executing the promises. Second is the progress indicator, which tracks the actual progress made. The platform tracks the implementation of 37 budget promises announced in the Budget Speech for which the government allocated Rs. 116, 910 million in 2017. The government remains weakest in terms of information disclosure and openness. 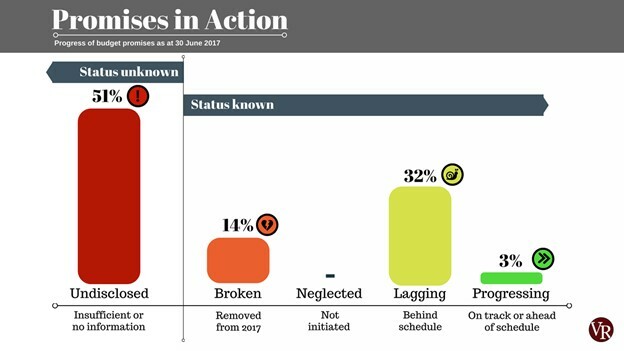 Information on the progress of 51% of the budget promises tracked is not disclosed. 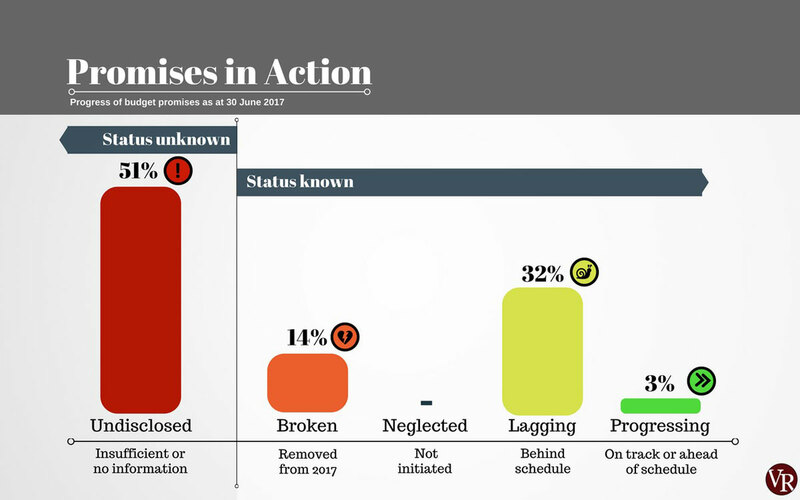 Meanwhile, 14% of the promises are broken, 32% are behind schedule and only 3% are showing progress. In the 2017 Budget Speech, the Minister of Finance announced that the details of the contracts related to all capital projects will be displayed on the websites from 1st January 2017. However, Verité Research found the information provided on the websites of the relevant Ministries to be minimal. Further, contacting the relevant government agencies to get information proved to be difficult. Therefore, to obtain information, the research team filed Right to Information (RTI) applications. Out of the 54 RTI applications filed, only 15 got a response within the stipulated time period and 16 received a response only after submitting an appeal. The remaining have not received a response to date.